The Upper Darby Performing Arts Center in Drexel Hill is minutes from Center City, the Main Line and the Blue Route. It is one of the most actively used community arts facilities in Delaware County. It offers free parking, a modern air conditioned theater, and a professional venue for a variety of family-friendly and affordable performances. 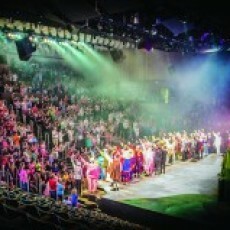 Each year more than 60,000 audience members travel from all areas of the Delaware Valley, from Chester, Bucks, Montgomery and Delaware Counties as well as Philadelphia and New Jersey for dozens of family-friendly performances.